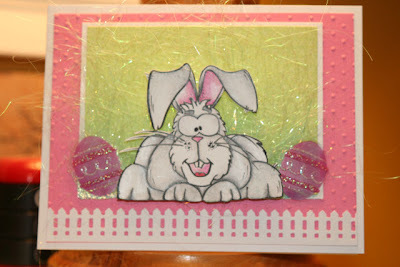 Yep, it's Tuesday and it's time to show you all another great image from Sunshine's Stamps . Today I want to introduce to you "Who's The Bunny", one of the newest additions to the Sunshine family! If you think she is cute, you have to go take a look at all her friends for this Spring/Easter!!! Adorable, Christina!! Love the background! Looks like the filling in an easter basket? So cool! Awww...this is so stinkin cute! I love the coloring on your bunny & that background. Hugs! Way cool. Love the look. I love how you did this - too cute! Love that cute fence punch and the grass and coloring are perfection!